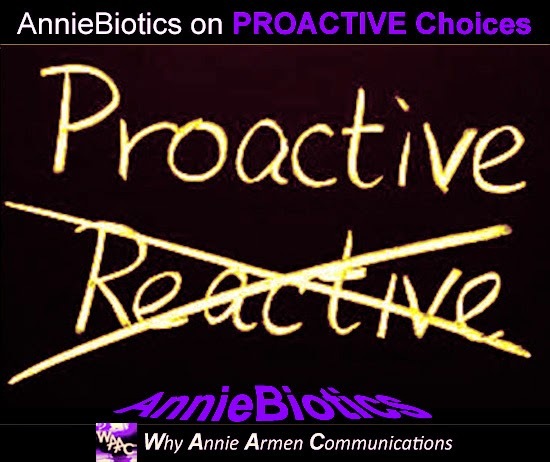 Why Annie Armen: To PRO-act or to RE-act – is that the Question or Your Choice? To PRO-act or to RE-act – is that the Question or Your Choice? Whether in business or in life, one guarantee we can all bank on in our daily lives is tackling challenges as we forge ahead through life’s unexpected, at times off beat twists and turns, with extreme spikes ranging from “chill to thrill” or vice versa, all in a matter of seconds, and at times in just a second! What is MOST critical during such moments is to purpose awareness, and immediately wake up to the reality that whether you are in your best (thrill) or in your worst (chill) situation, YOU hold the key to two choices -- to PRO-act or to RE-act! Way passed the wondering phase of whether “that” is a mere question… To PRO-act or to RE-act – THAT is your choice! Bottom-line, when you choose to give your ears to any one of the 9 "pollutants" referenced above, then in the words of Og Mandino, you are “permitting your thoughts to control your actions". Let's backtrack.. when you permit your emotions to influence your thoughts, now your infected thoughts have the green light to control your actions. In doing so, you are choosing to RE-act to any given situation, at which point -- achieving less than favorable outcomes is only inevitable (and that’s stating it mildly). Purpose Awareness at ALL Times! Intentionally hitting the REWIND button here for a moment to repeat these words from earlier: What is MOST critical during such instances is to purpose awareness, and immediately wake up to the reality that whether you are in your best (thrill) or in your worst (chill) situation, YOU hold the key to two choices -- to PRO-act or to RE-act! Dear friend, I cannot emphasize enough how important it is for you to purpose awareness at ALL times, particularly during times of vulnerability, mixed emotions, confusion, hurt feelings, betrayals … in essence when you feel like you are at your worst, in a dark place or space whether personally or professionally. Equally if not MORE critical, is to purpose awareness during times when you are in your comfort zone, where you are feeling you are at your best, perhaps even feeling overly confident, dare I say greedy, too proud, and the like. Sound familiar? Whether in business or in life, remember that extreme spikes of “chill” and “thrill” happen when you least expect it, sometimes within seconds, other times within a second. So again… purpose awareness at ALL times, and stay alert when you are in the “comfort” zone, or rather what I like to call – the “blind spot”. Without a doubt, this is a continuous, cleansing / purifying process and takes daily practice, for knowledge alone is never enough! What is worth noting here is maintaining “balance” between mind and heart … making sure both are working in harmony to accomplish set goals and objectives with satisfaction and success! 2. Stay alert when in your “comfort zone” – blind spot. 3. Maintain balance between mind and heart. Only when the two are in accord, you are ready to PRO-act, make sound decisions and aim for the long-term win! 1. 30 Quotes on LOVE in Business and in Life! 3. 20 Quotes on VALUES in Business and in Life! 5. 30 Quotes on ACTION in Business and in Life! 6. Are you Leaving Your AUTHENTIC Mark? 8. Grab a cup of Courage and Just Ask!